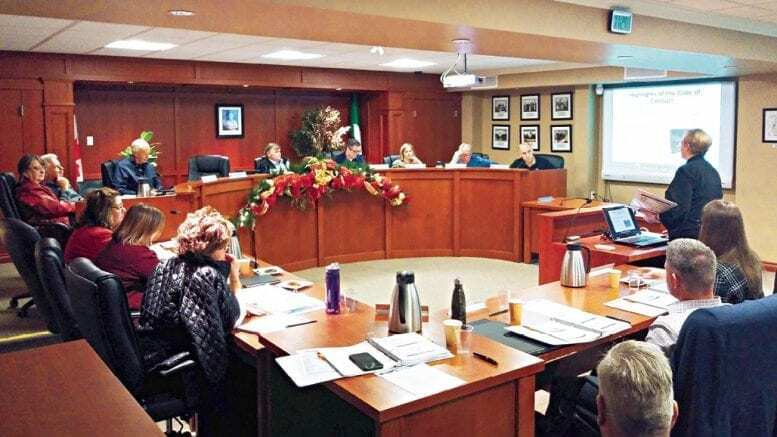 On Saturday, December 1, Pelham’s new Town Councillors took their seats at the horseshoe in council chambers for an orientation meeting. Mayor Marvin Junkin, Ward 1 Councillors Mike Ciolfi, and Marianne Stewart, Ward 2 Councillors Ron Kore, and John Wink, and Ward 3 Councillors Lisa Haun and Bob Hildebrandt dropped the “elect” from their titles. The group received day-long training on procedures and policies through presentations made by each of the Town’s departments. Pelham Chief Administrative Officer, Darren Ottaway, spoke on the distinction between governance and administration. Town Clerk Nancy Bozzato presented on codes of conduct, the Municipal Freedom of Information and Protection of Privacy Act (MFIPPA), meeting procedures, and the role of the Clerk’s Department. A member of the Town’s legal counsel, Terrance Hill, presented on determining conflicts of interest, how to work with speaking to the media, and a variety of legal issues that a councillor may potentially face during their term. Director of Public Works, Jason Marr, Director of Community Planning and Development, Barbara Wiens, Director of Corporate Services/Treasurer, Teresa Quinlin, Director Recreation, Culture & Wellness, Vickie vanRavenswaay, and Fire Chief Bob Lymburner outlined the roles, responsibilities and services provided within their respective departments. The new Mayor and council were to be ceremonially sworn in after the Voice went to press on Monday evening, at the community centre.